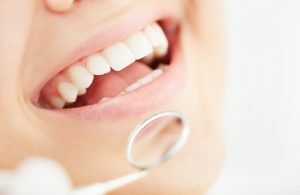 Periodontal Maintenance | Chris M. Herman D.D.S. Periodontal maintenance consists of periodic removal of bacterial plaque and calculus from both above and beneath the gum line in patients who have undergone treatment for periodontal disease (periodontitis). It is typically performed on a two to four-month interval so that removal of bacterial colonies can be completed before they become sizable and aggressive enough to cause more damage to the patient’s gingival attachment and bone. Localized scaling & root planing (SRP) may be necessary to control areas of active inflammation, but periodontal maintenance does not generally include performance of SRP throughout the mouth. Periodontitis is not curable, but is treatable, and with active management may be controlled indefinitely. Once there has been damage to the gum tissues and tooth supporting alveolar bone from periodontal bacteria, periodontitis must be actively managed by dental professionals to avoid progression of the disease, and loss of the teeth. Periodontal maintenance includes localized, non-surgical procedures necessary to keep the disease under control. In some cases, treatment with locally applied antibiotics (Arestin), may be recommended in conjunction with periodontal maintenance. Periodontal maintenance is prescribed whenever a patient has been diagnosed with, and treated for periodontal disease (periodontitis).